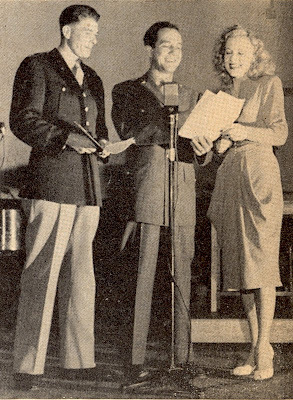 "Captain Ronald Reagan, Sergeant Cully Richards, and singing star Ann Jeffires, smile over their script in 'Birmingham Showtime' series, which is presented at 6:30 p.m. every Saturday over KFWB." 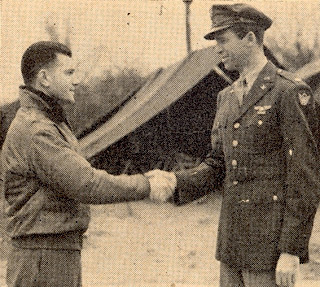 "Congratulations - Lt. Leon Schwartz, 1st Lt, D.C. upon the award of the Air Medal to your (note - may have mean 'his') brother, Lt. Col, Paul Schwartz, shown congratulating Major Jimmy Stewart, who also received the Air Medal. - Lt. Col. Schwartz is deputy commander of a heavy bombardment group of the 8th Air Force, operating from Great Britain. He entered the Army as a cadet at Randolph Field in 1938, and previous to his present assignment, was CO of the B-24 Group at Pocatello Air Base, Idaho. We are proud to have the brother of such a man to take care of some of our dental problems here at Birmingham." Note: It was customary in the American press during the World War II era to identify people by their race. "Fresh from a jivy rendition of "Ride, Red, Ride", stand the famed Charioteers. 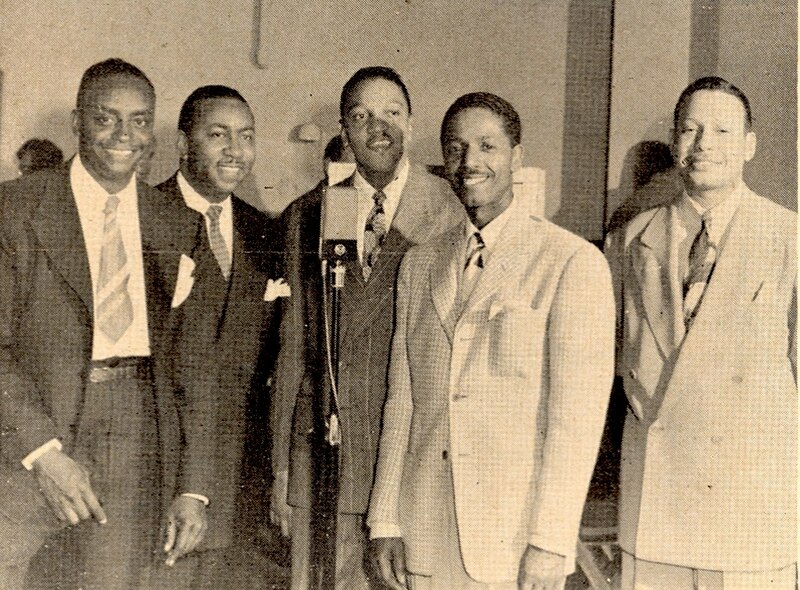 The five Negroes were stellar participant in "Birmingham Showtime", BGH's own radio program." Reading this after I read the other post on Birmingham Hospital. Wish my father were still alive to send this or to ask. He was in the 8th AF. It must have been an awfully large division as so many foklks were in it.Any more info you may post is of great interest. Thank you.